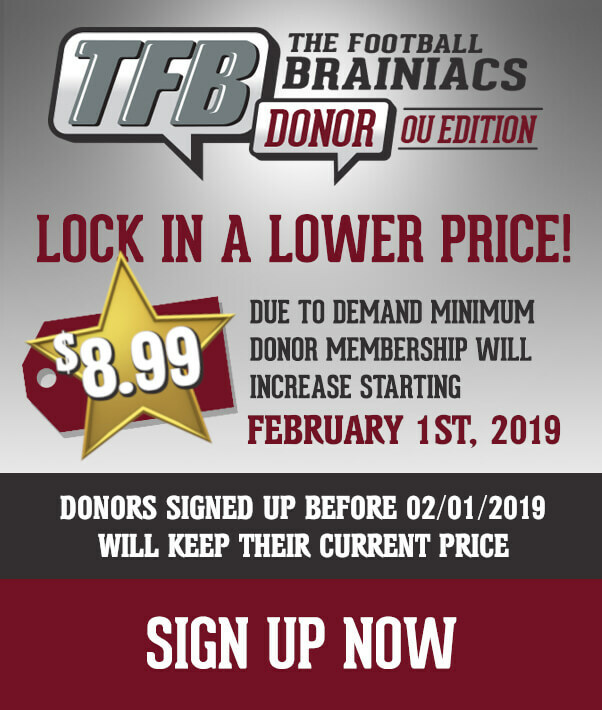 1st off, I’d like to thank you all sincerely for being part of the TFB family. We’ve been at this now for four years, and some of you all have been with us from the start. I’m so thankful that we have a place that we can all come and talk Sooner football and have a good time. As we grow and expand I want you all to know that you’re all very important to us, and we’ll always keep you fellow Braniacs as our primary focus. Simply put, without you there is no me. I’d like to wish you all a Merry Christmas, Happy Hanukkah, Happy Kwanza and for you Seinfeld aficionados, Happy Festivus! The fulltime job has had me runnin crazy the last few days so I’m sorry that I haven’t been able to do one of these every day. We’ve got a week and a day leading up to the Rose Bowl, so hopefully I’ll get it caught back up. 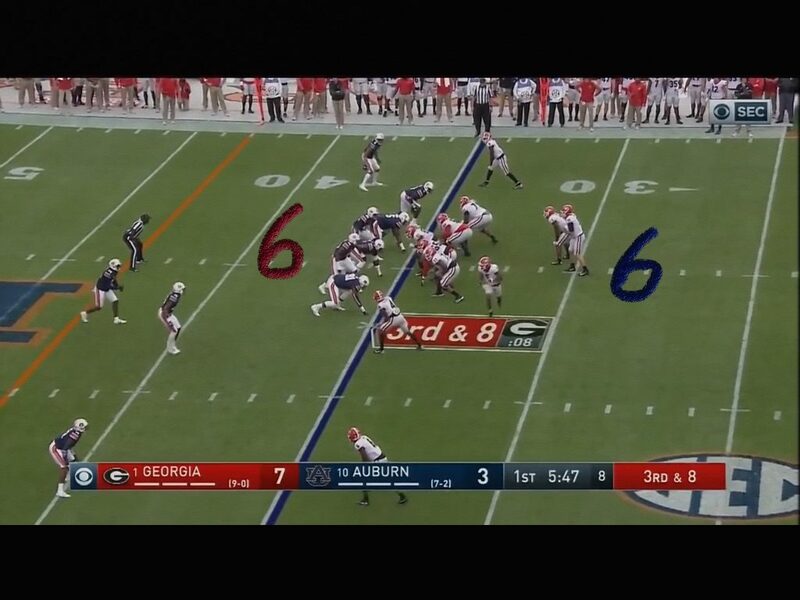 Auburn showed 6 man blitz out of a 4-2-5 look. 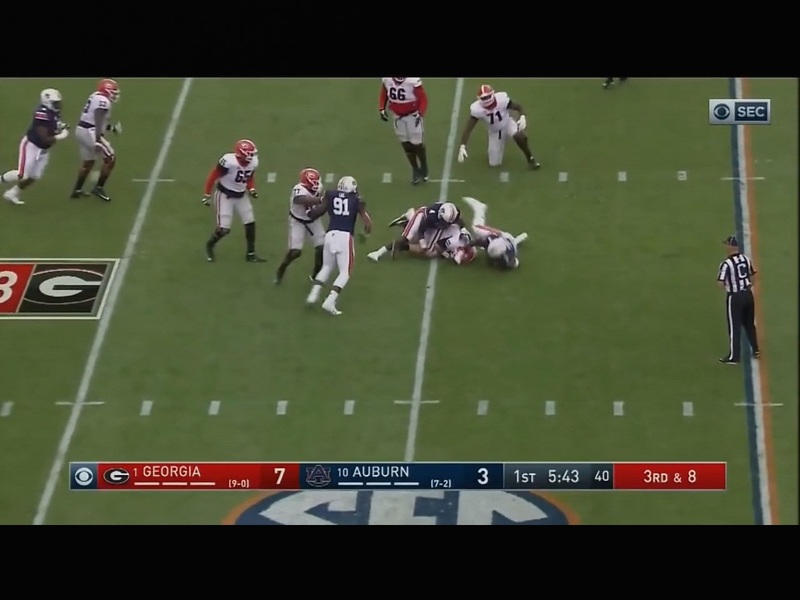 Georgia stuck with the play as they had an open set (5 OL) and 1 back. 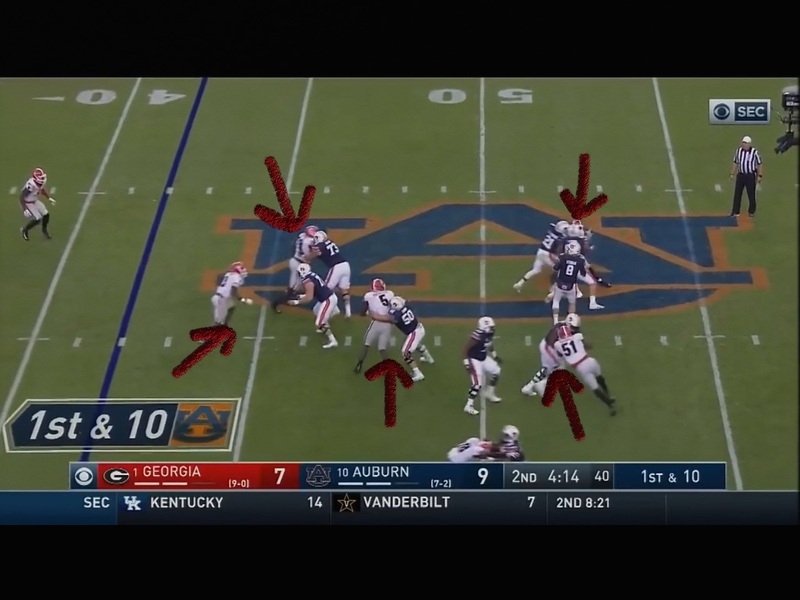 This can be labelled as either confidence or arrogance because had Auburn brought everyone, then the 5 ol and rb would have each been one on one in pass pro. On the snap, the two linebackers dropped, so the Tigers only brought four. This is a 7 step drop for the QB Fromm and a long developing play. It makes me think a couple of things. 1st, they don’t adjust when a team is showing all out blitz. 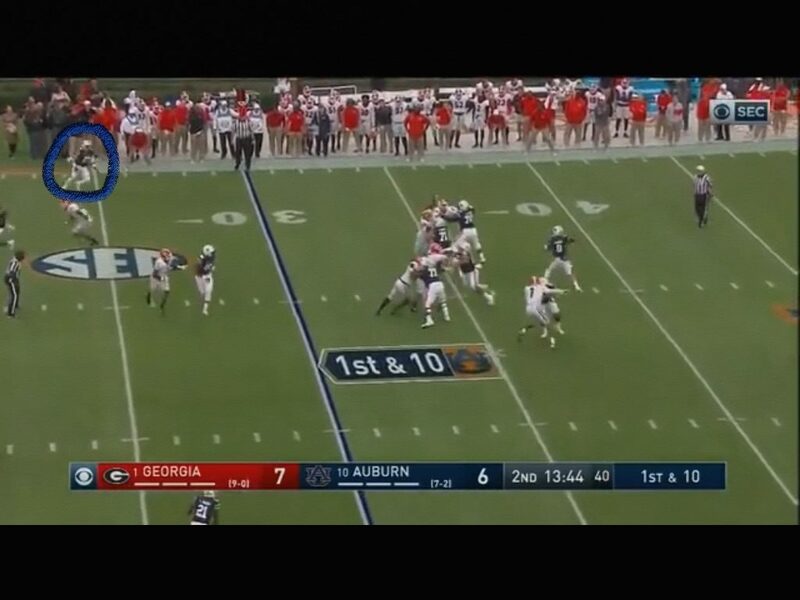 In the picture before, 6 defenders were showing coming, but the Tigers stuck with a 7 step drop rather than looking to change the play and get to a quick throw. 2nd, Obo, Mann and Kelley will have a chance to get to Fromm if the Sooners can get Georgia to 3rd and long. 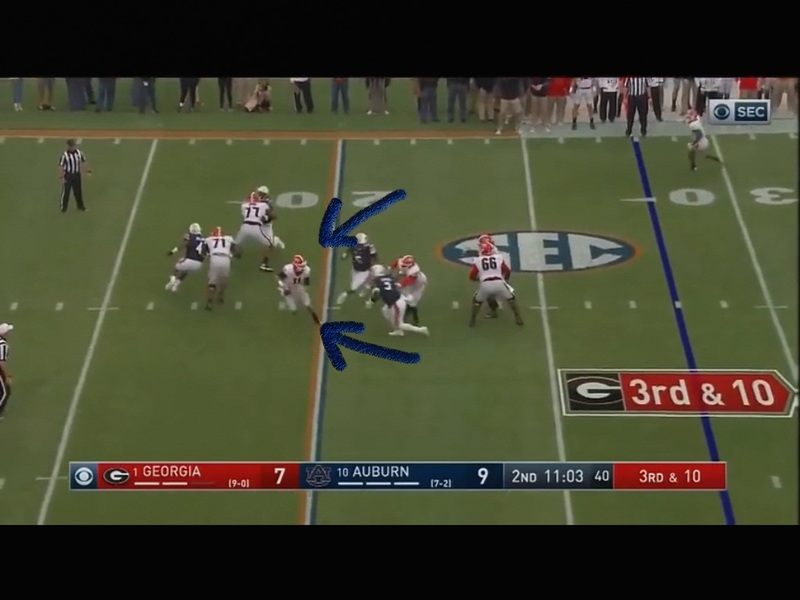 This pressure wasn’t coming at Fromm’s blindside. It was coming at his front shoulder, and he still didn’t feel it. He had room to step up into the pocket and help out his tackle, but he stayed stationery. It’ll be interesting to to see as I go through this for the SEC title game if he fixed that. It the Sooners give Baker Mayfield time to throw the ball, there are holes in this secondary. There are very talented players, but there are openings. Baker is very good at going through his progressions as long as you give him time. Sorry this picture is so grainy, but the big tight end is wide open on a simple 5 yard stop route. The tackles are pretty decent at pass protection. But again on 3rd and long in an obvious passing situation, the Tigers got home. Lampkin, Overton, Gallimore, Mann & Ward will need to have huge games to bring pressure up the middle. 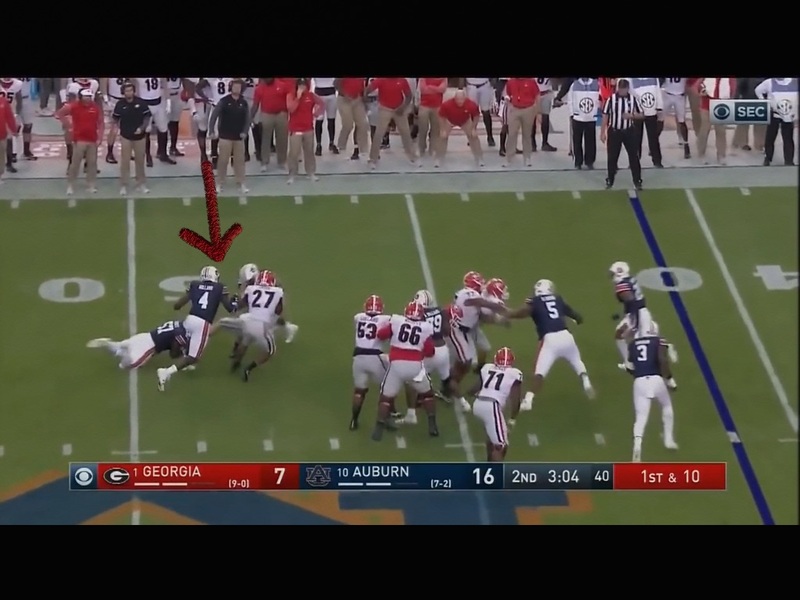 In obvious passing situations, the big interior OL for Georgia can be had. They’re good, but the Sooners can’t let them get to 3rd and 4 or less all night. Get em to 3rd and 6 or more and heat em up. 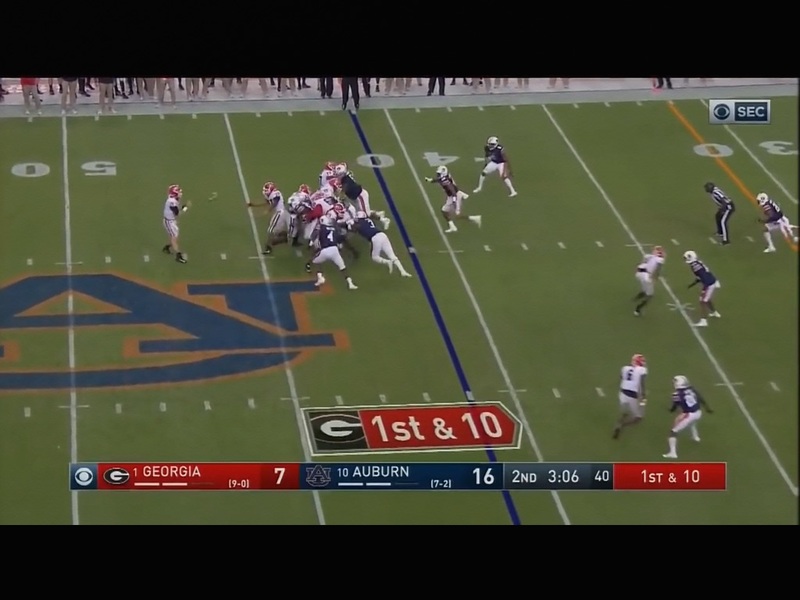 In this 1st matchup, Malzahn did a great job mixing up play calls and keeping Georgia off balance. This is a 1st and 10 around midfield, so they go with a big set, and max protect. 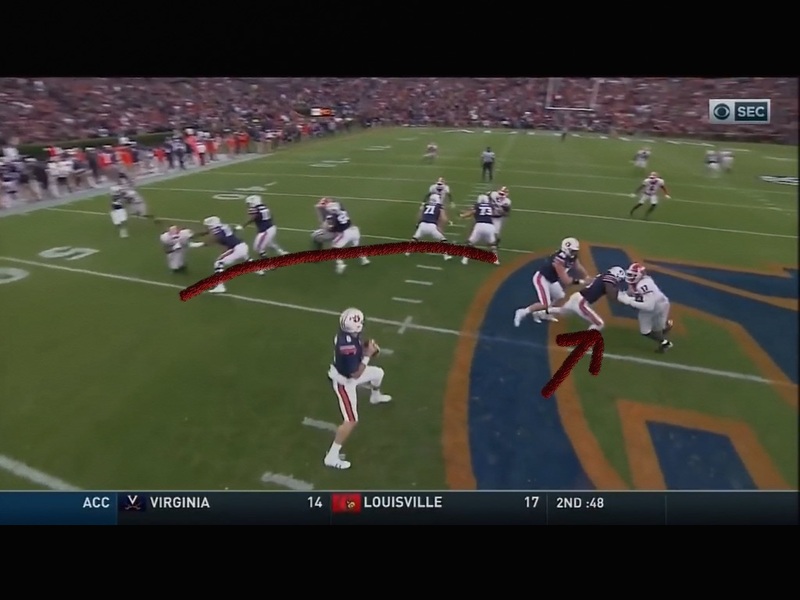 Right next to Stidham’s front, you have the back and a jumbo tight end doubling the rush linebacker. Everyone else does nice job protecting although #50 is a borderline hold. Here’s a better look at it, anand you can see the safeties way back there peeking into the backfield. The post route right up around the top right corner is starting to come open, and the cardinal rule of safety play is to not let anyone get behind you. Again protection is the key to all things. And here is the end result, a deep TD. Look at all of the space to the left of #20. 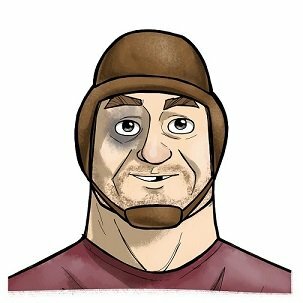 Riley is a savant at exploiting weaknesses in a secondary, so if the Sooners can run the ball enough to keep the safeties conscious of it and protect Baker, then they’ll have success. 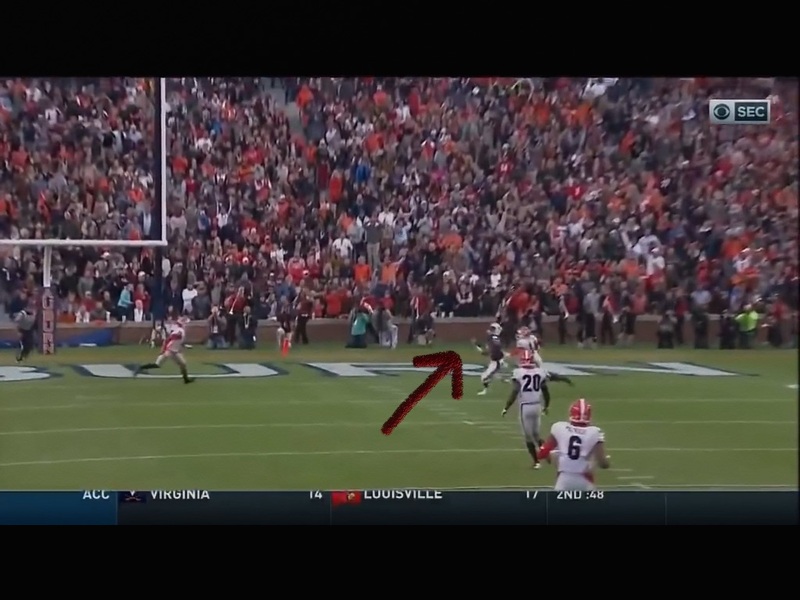 Like, Riley, Georgia likes to run this flea-flicker play. This is a 1st down look at midfield, and a good spot to take a shot. In the 1st matchup, Georgia tried to throw the ball a little too much. In the 2nd they relied on their backs more. 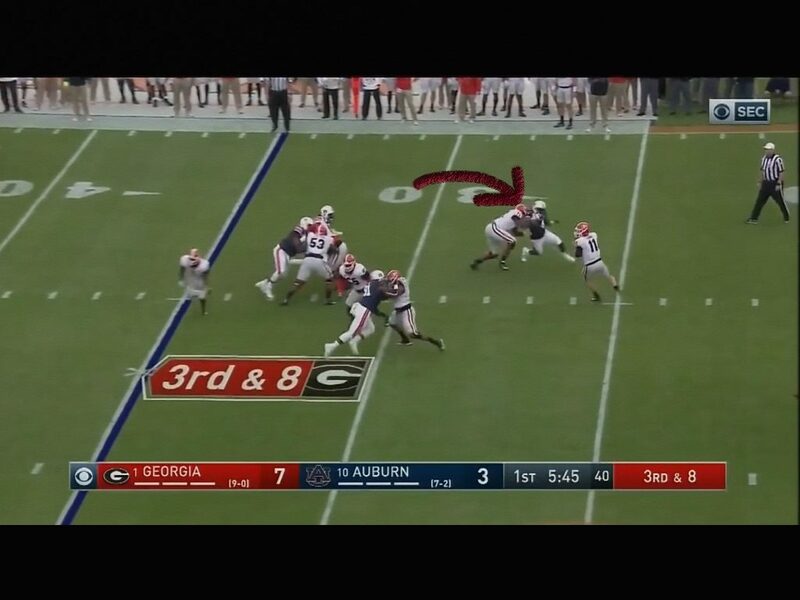 Even still, the Auburn DL is playing on the GA side of the line of scrimmage here. And this ended up going from a 1st and 10 to a 2nd and 17. It’s a risky play on the +41 and absolutely killed the Georgia drive. Can the Sooners get pressure? The defense nobody’s talking about is Oklahoma’s. Hopefully that ticks everyone off in that defensive room and we see an inspired performance.